Looking for a challenge I thought 2012 could be the year where I expand my brain a little and explore an area of wayfinding I have little working knowledge of. I have worked as a Wayfinding consultant for almost 5 years now and I’ve worked in areas including airports, rail stations, urban environments and hospitals, but the closest I have ever got to retail is a project in a large shopping centre. 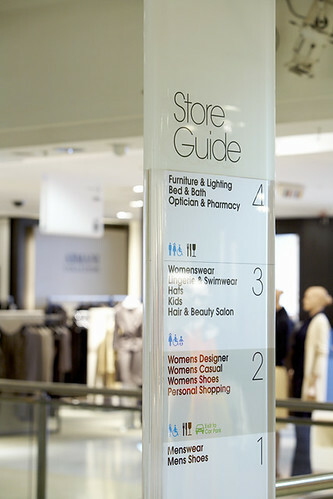 When did the retail sector begin to realise the importance of wayfinding? What do retailers hope to achieve with instore signage and graphics? What is best practice, is there an industry standard? How much academic research has been done on the subject? Are there any official statistics on how a good signage system can effect sales? Many stores commission designers to create beautiful new systems, but once the designers have left the building, who is left to ensure the well thought out designs adapt and grow appropriately as the store evolves? How much effort is put into the strategy behind the system and its upkeep in comparison the the physical appearance? Do all department stores, large supermarkets and flagship stores have a signage manager or a team of people looking after wayfinding? If so what background do these people typically have? Are they designers, store planners, interior designers, visual merchandisers or faciltity/estate managers? In many environments wayfinding is about getting from A to B as quickly and as efficiently as possible, but with retail there seems to be an element of wanting customers to explore or stumble across things they were not looking for and sending them on strategic routes encouraging them to stray off their original path without feeling lost. In some stores like Ikea the tactic is for you to spend as much town wandering around as you can! to help communicate the brand and create a strong visual identity. I also believe that much of the above could be achieved through good store planning, interior design and visual merchandising, rather than just signage and directories. This again leads me to the question of who takes responsibility for it? If anybody has any useful links, examples of information on existing research, works in this sector or has their own opinion on the subject please feel free to post a comment or contact me directly. 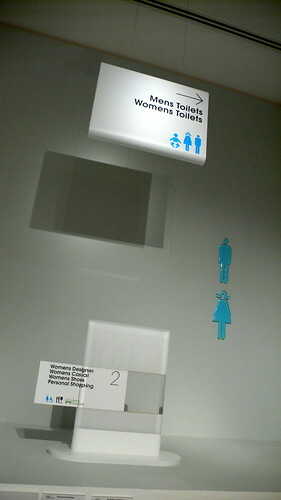 This entry was posted in Signage, Wayfinding and tagged Retail, Signage, Wayfinding. Bookmark the permalink. Good probing questions – I will try and catch up with you at the next SDS Talk. 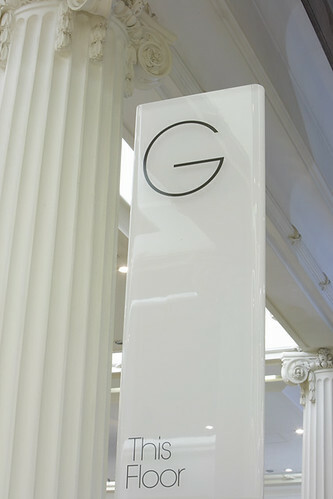 We operate in the Shopping Centre world where the approach to wayfinding is becoming more and more sophisticated. The importance of understanding people and providing to their needs first rather than the retailer or operational requirements is core to what we do and we have learned much from how shoppers behave in department stores. There are others in the SDS group, including retailers, who may be able to share their views – could be a good discussion. Thanks for the feedback. I’m looking forward to delving a little deeper into the subject, but glad it has attracted some good responses so far.